How much is shipping and when can I expect my parcel if I placed an order today and live within the UK? I live overseas and want to place an online order. How much will shipping be and how long will it take to arrive? Are ALL product ingredients listed on the packaging? Where should I store my MooGoo and do your products have an expiry date? Can I use MooGoo on a newborn? I have extremely sensitive skin, will I react to MooGoo? I am Lactose intolerant. Are MooGoo products ok for me to use? What’s the difference between the Skin Milk and Full Cream? Can I use the Milk Wash as a facial cleanser? I think I have Eczema. What products will help? Is the Irritable Skin Balm a moisturiser? I have just purchased a tube of the Irritable Skin Balm. How long until I see results? I have flaky skin on areas surrounding the nose, ears and nape of the neck. What is it? My infant has cradle cap. What should I use? I am prone to breakouts/acne. What products will help get my skin under control? I have Keratosis Pilaris, what products will help? All UK orders under £60 will incur a £5.00 flat rate shipping charge. Orders are dispatched within 1 business day of receiving payment and sent via Royal Mail. You can expect your order to arrive within 2-5 working days. YES! 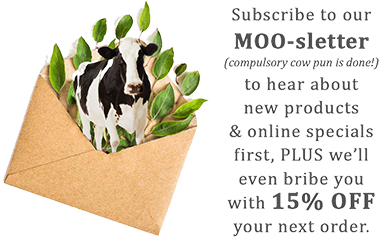 Here at MooGoo we take the “No Gimmick” approach very seriously and believe it is important to inform people what they are putting on their skin. “Therapeutic Products” actually have no requirement to list all of their ingredients, but we do it voluntarily. No secrets here...we are as proud of the back of the bottle as we are of the front. All MooGoo products should last 24months if stored under 30 degrees celsius away from sunlight. We have the products independently tested (a British Pharmacopeia Preservative Efficacy Test) to make sure they are sterile. This is very important as our products are often used on children or people with broken skin and contaminated products can be dangerous. We use an organic preservative system in all of our creams except for our Irritable Skin Balm which has different requirements as it is a therapeutic product. We make our cosmetic products to be suitable for babies. We suggest looking through the ingredients of any product to make sure that as a parent you are comfortable putting this on your child's skin. For any skin problems we suggest consulting a medical professional. Everybody is different and what works for some will not for others. Some people have allergies to natural ingredients. A good example of this is that people may be allergic to certain fruits, nuts or milk, but never to synthetic products like Cola. This does not mean Cola is better for everybody; it is simply how the immune system works. At MooGoo, we believe for most people, natural products are better. As with all natural products, we do suggest you patch test first. I am Lactose intolerant. Are MooGoo products suitable for me to use? Funnily enough, the majority of our products do not contain milk. We were called MooGoo because the first of our creams was based on a cream used on cow’s udders. We do add Milk Protein to some of our moisturising creams as it happens to be very good for maintaining skin elasticity as we grow older. The protein is not related to Lactose. If you have an allergy to Milk Protein (rather than Lactose) you may want to choose creams without Milk Protein. They include the Irritable Skin Balm, the MSM Soothing Cream and the Scalp Cream. The Skin Milk is our original and lightest formulation. The Full Cream is similar but has added ingredients to make it richer for those who need a little more in the winter months or suffer from extremely dry skin. Both can be applied either on the body or face...wherever you need it. Indeed. Our Milk Wash uses cleansing ingredients that were first formulated for use in face cleansers and baby wipes. That is why the Milk Wash doesn’t foam that much. We thought if they are gentle enough for the face, most people would want the same for the rest of the body and we bottled it as an overall wash. It is one of the most gentle cleansers available anywhere. Eczema can be thought of as an allergy that breaks out on the skin, often starting with small red bumps and spreading with an itch. There is more information on our website under “Eczema”. Your doctor will provide information and often prescribe a cortisone based anti-inflammatory cream. This can be very effective at bringing an acute breakout under control, but there are limitations for longer term use as discussed with your health care professional. Our Irritable Skin Balm is also anti-inflammatory and has helped allot of people get this condition under control. It can be used as often and for as long as needed. Our MSM soothing cream is also great for Eczema and once the condition improves, you can use this to maintain healthy skin. Although the Irritable Skin Balm has some moisturising oils, it is not specifically a moisturiser. The Irritable Skin Balm is a topical treatment to be applied to affected areas. As Eczema and Psoriasis are both dry skin conditions the balm works great in conjunction with a moisturiser. Our MSM Soothing Cream is ideal as it has high concentrations of MSM, a well-known soothing ingredient, great for Eczema. Everybody is different and results do vary but you should be seeing an improvement within a few days of use. The balm acts as an anti-inflammatory (Eczema is an inflammation of the skin) as well as controlling Seborrheic Dermatitis. As with all natural products, we suggest you patch test first. “Psoriasis of the Scalp” can sometimes be confused with Seborrheic Dermatitis. Seborrheic Dermatitis will cause an itchy or flaky scalp, but can also spread to the hairline, ears, the eyes and eyebrows or along the side of the nose as well as other areas. It is related to Cradle Cap and is a reaction to the Malassezia yeast which is a normal part of the skin’s micro-flora. Our Milk Shampoo and Conditioner are natural and do not irritate the scalp, and we include Piroctone Olamine. As these are wash off products, the time that they can remain in contact with the skin to help is limited. If the condition is severe, a cream such as our Scalp Cream can be rubbed onto the affected areas. Please see our “We got mail page” to read of other people’s experiences. Plaque Psoriasis can be much more difficult to control and there are specialized products that may need a prescription from your doctor. Cradle Cap is the infant form of Seborrheic Dermatitis. There is more information about this on our website under “Eczema”. Cradle Cap is normally very easy to control. We would suggest our Irritable Skin Balm, our Scalp Cream is also designed for dry and flaky scalps. You can then use when needed throughout the day. Our shampoo is another option (especially if your little one has a lot of hair) and will help control the micro-flora of the scalp. It is extremely gentle and great for babies. Although in the beginning we did not set out to address this issue we have had feedback from quite a few people that have success with The Oil Cleansing Method. MooGoo's Blemish Cleansing Moisturiser takes a new approach to acne. It is a cleansing cream that also works as a leave on moisturiser. This keeps skin healthy and young looking by using a high quality natural cream packed full of anti-oxidants, rather than chemicals. Other parts of the formulation help prevent excess oils on the skin becoming rancid which can be a cause of Acne as well as cleanse the skin of bacteria. There are also studies that show Resveratrol is a successful treatment for acne and our Anti-Ageing Face Cream has a high percentage of this particular ingredient. We do suggest in extreme cases that you consult your doctor. Many people have found that using our Milk Soaps and Skin Milk moisturiser in conjunction with one another produces the best results. This may be because our Milk Soaps are super-fatted with Cocoa Butter, leaving behind butters and oil which help prevent the plugs of keratin becoming hard. Wash with the Oatmeal soap, to loosen the plugs, followed by a light moisturisation like the Skin Milk. Sorry, we know how frustrating this can be. Are you experiencing one of the following problems? If so, hopefully one of the suggestions below will assist you. If not, please contact us by completing the troubleshooting form and we’ll be in touch asap. Try resetting your password by clicking on the ‘forgot your password’ link. If you've noticed a problem with our website, please let us know using the form. If you include as much detail as you can, it will give us the best chance of fixing the issue quickly.